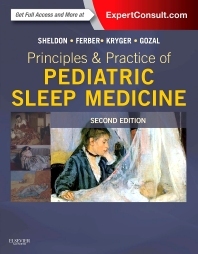 Principles and Practice of Pediatric Sleep Medicine,2nd Edition, written by preeminent sleep medicine experts Drs. Sheldon, Kryger, Ferber, and Gozal, is the most comprehensive source for diagnosing and managing sleep disorders in children. Newly updated and now in full color throughout, this medical reference book is internationally recognized as the definitive resource for any health practitioner who treats children, providing absolute guidance on virtually all of the sleep-associated problems encountered in pediatric patients. Organized format separates coverage into Normal and Abnormal sleep for quick access to the key information you need. Abundantly referenced chapters help you to investigate topics further. Equips you with a complete understanding of both medical and psychiatric sleep disorders. "True to its title the Principles and Practice of Pediatric Sleep Medicine Second Edition achieves its objective of delivering the principle s of approaching the problems relating to sleep disorders in children . As a reference book this edition should hold its value for a long time .Editors Sheldon, Ferber , Kryger and Gozal deserve appreciation for their masterly compilation . eBook version naturally adds further versatility and ease for the readers."